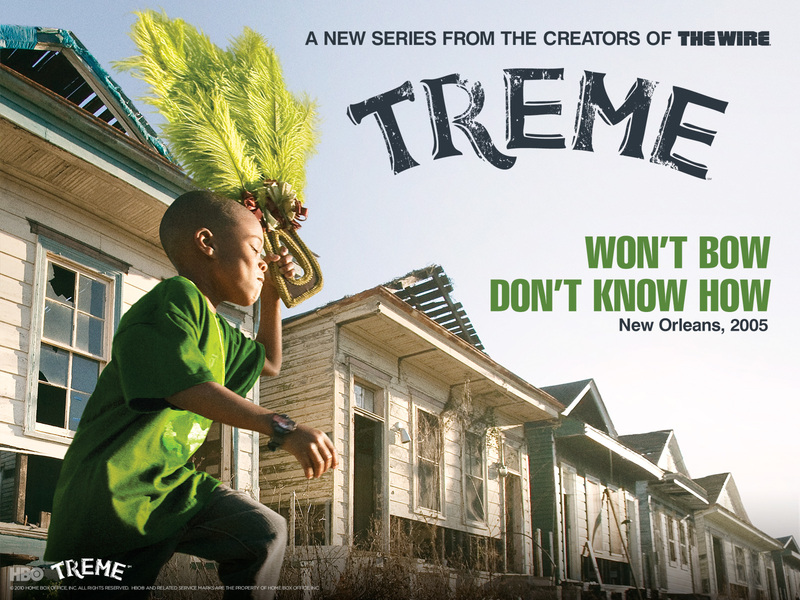 About a week ago, I stumbled upon Tremé, an HBO series set in New Orleans after Hurricane Katrina. It’s the story of several New Orleanians struggling to rebuild their lives after the catastrophe. On a grander scale, it paints a poignant picture of a unique culture determined to preserve itself against the odds. In a few days’ time, I had already watched the entire first season; I hadn’t felt such an immediate attraction to a television series in a very long time, and I simply couldn’t stop watching it. The music and the scenery brought back memories of my first and only visit to New Orleans a few years after the hurricane, and I decided that I needed to see it again one day and show its magic to Michel. And, of course, all this happened in the days leading right up to Mardi Gras. Mardi Gras, meaning “Fat Tuesday,” is a Christian holiday marking the end of the season of Epiphany and the beginning of the season of self-sacrifice called Lent (or Carême, in French). It’s the culmination of Carnival season, when you’re expected to indulge (notably in fatty foods—hence the name) in advance of the solemn season that follows. If you’ve ever been to New Orleans—whether at Carnival season or even in November—you know that no one does decadence quite like the Crescent City : think shrimp po’ boys and spicy gumbo, warm beignets dusted with powdered sugar at Café du Monde, and Hurricanes in go-cups. At the end of the 17th century, King Louis XIV sent an expedition to explore the new French territory of Louisiana (which had been named in his honor, of course). The expedition arrived at the mouth of the Mississippi River on the evening of Monday, March 2, 1699, and continued upriver during the night. When the expedition stopped in the early hours of the morning to build the first French encampment in Louisiana, they named it after the new day : Pointe du Mardi Gras (located about 60 miles south of present-day New Orleans). In this sense, one could say that Louisiana itself was born on this most decadent of holidays. 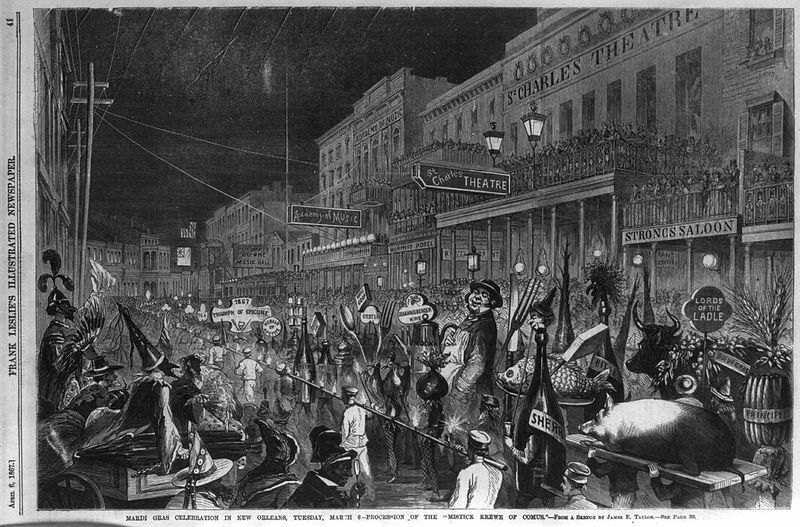 The city of New Orleans came along some two decades later (after Mobile and Biloxi) and it didn’t become the capital of the Louisiana colony until 1723, but the Mardi Gras story quickly became intimately linked with the city’s identity. It’s unclear when the first grand Mardi Gras festivities were celebrated in New Orleans but, by 1743, Mardi Gras masquerade balls were in evidence. By the early 1800s, the procession of costumed party-goers had evolved into full-fledged Carnival parades and, by mid-century, organizations exclusively dedicated to the city’s Mardi Gras festivities—called krewes—had been formed. The oldest of these, the Mistick Krewe of Comus, is still in existence, along with Krewe Endymion, the Krewe of Momus, the Krewe of Orpheus, the Krewe of Proteus, the Krewe du Vieux, Rex, the Zulu Social Aid & Pleasure Club, and many others. The masquerade balls, the Carnival parades with their purple, gold and green “throws” (doubloons, beads, even painted coconuts), and the accompanying drunken revelry in the streets are all hallmarks of the New Orleans Mardi Gras experience. It was French settlers in the 18th century who first introduced the King Cake tradition to the Gulf Coast. The Gulf Coast version, however, bears little resemblance to the version you find here in Paris and in the north of France. Our galette des rois is a flat puff pastry stuffed with frangipane (a dense paste made of ground almonds, sugar, butter, and eggs). 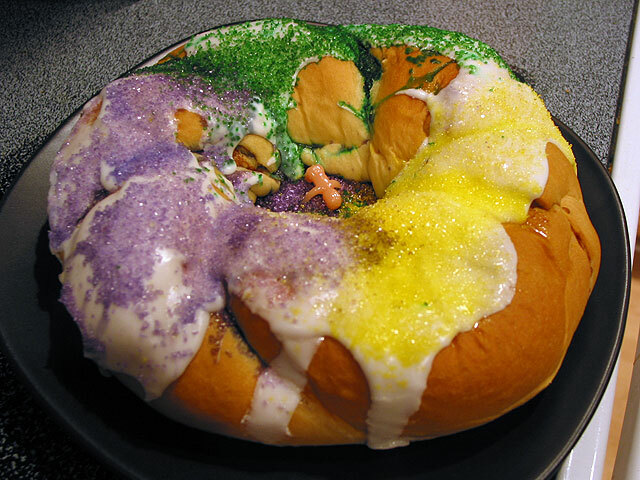 The King Cake, in contrast, is made of a brioche-type bread and, as such, more closely resembles the Spanish roscón des reyes or the gâteau des rois, the Occitan version from the south of France. Unlike the Spanish and Occitan cakes, which are usually topped with dried fruit, the King Cake is iced and sprinkled with purple, gold, and green sugar—distinctively New Orleanian. 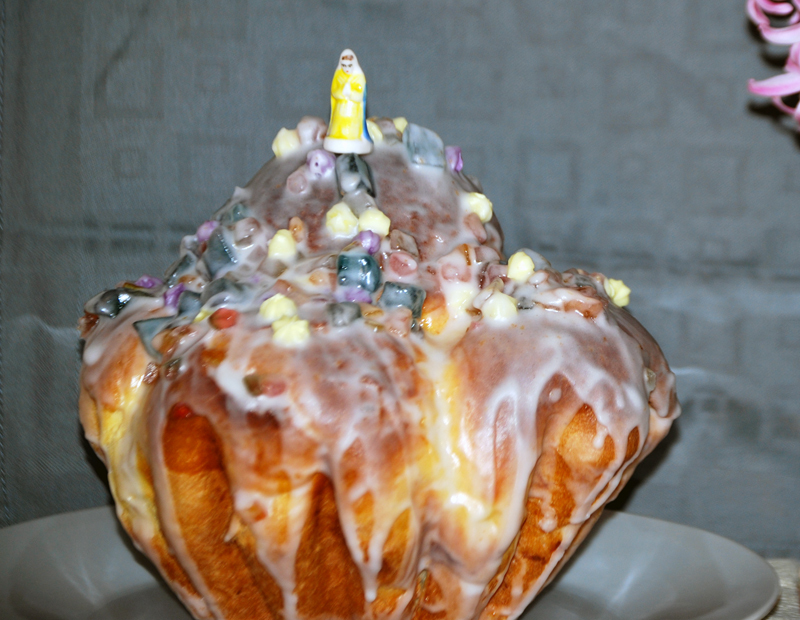 Like all of these desserts, the King Cake is stuffed with a small trinket (traditionally a Baby Jesus), which serves as a prize of sorts for the one who finds it. The reason for the Baby Jesus is that these desserts were traditionally part of the celebration of Epiphany on January 6, commemorating the visit of the Three Kings. In another distinctively New Orleanian twist, though, the King Cake is consumed throughout the Epiphany season right up through Mardi Gras, weeks after everyone else stops eating their cakes. It might be more difficult to explain why there’s a Baby Jesus in your dessert on Mardi Gras than on Epiphany, but don’t worry—everyone will be too busy eating to wonder why. … and talk some more about a trip to New Orleans, maybe even next year. 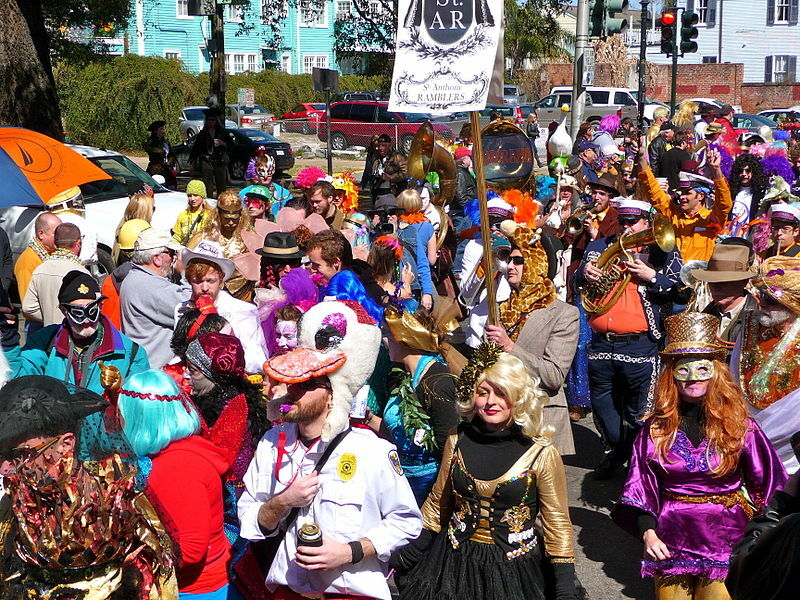 Click here to read about Mardi Gras 2013! Joyeux Mardi Gras ! Laissez les bons temps rouler ! Happy Fat Tuesday! Let the good times roll! One of the most well-known French phrases in America, “Laissez les bons temps rouler!” is an expression often used to describe the indulgent, party atmosphere of New Orleans. It literally means “Let the good times roll!” The interesting thing about the expression, though, is that it’s not really “French”; instead, it’s a calque—the word-for-word translation into French by Louisiana’s Cajun population of a pre-existing English phrase. If you ask a French person about it, you’ll find that they understand the words, but the idiom is lost on them. It’s a 100% Louisiana creation! ← Suspense. It’s French … sort of. I am learning more about French with every one of your wonderful, informative posts. Thanks. And Happy Mardi Gras, laiisez les bons rouler!! Thanks! Happy Mardi Gras to you, too! … or should I say “Shrove Tuesday”? Having pancakes today? Here in Alabama, they’ve partied till the cows came home down in MObile . ( Try translating THAT into French! 🙂 I’ve had the King Cakes here and in Paris. You know which I prefer I’m sure. BTW, I found the feve in January and got to wear the crown! PS Congrats on your blog award. Ha ha, Virginia! That would be a difficult one to translate! Glad you enjoyed the post and sorry there wasn’t more about Mobile. Interestingly, before I started this blog post, I had no idea that Mobile was founded by the French before New Orleans or that it was the first capital of the Louisiana colony of New France … until Biloxi 18 years later! Congrats on the fève … I almost never get it. P.S.—Did I get a blog award? Found my way here via Aidan’s site too! Love what you have to say. We moved to Paris in August and my eight year olds still resolutely speak ‘American’ not English or French!!! Very cool! I’m so happy to be getting these great new readers from Aidan’s blog. Bienvenue! I hope you’ll keep coming back from time to time to see what’s new with me! Found my way here by Aidan also – what a great spot!! You will love NO – I have been there many times and never get bored or tired of just walking around. If you go do get out of the Historic French Quarter into the city… another suggestion would be to rent a car and drive out of the city and up River Road – some great old houses to visit! Wow, Aidan is the best thing to happen to my blog’s stats in months! Thanks Edgar, for the tips! We will definitely keep them in mind when we do eventually get there. Personally, I can’t wait. I don’t think a trip to NOLA could come soon enough for me!